Kabloomkrashbang! The klronors had breached the door down the hall and were rampaging through the apartment. Quietly, I grabbed my cloaking robe, dawning it as I slid out the window and down the fire escape. My destination was the first black glass window paneled building I could locate. According the map, I was two blocks away from the closest access tunnel which was below a black glass paneled building (BGPD’s). That is what BGPD’s signified, they were monuments signifying access to the underworld of tunnels that traversed the subterranean. One required a sort of tunnel vision of inner Earth to properly grasp the magnitude of the network of interconnectedness of the nether realm. Enter below. The BGPD’s were the crystalline representation of the monument observed in 2001: A Space Odyssey. Access to the BGPD’s was gained by interfacing with the three-dimensional matrix as a type of calculator. The buildings coordinates, dimensions of the panels, and properties of the three-dimensional shape were used to access the buildings lower-tier floors access code. The code was easily accessed with GRINr tech or with a map, not just any map, a MAP (Multiverse Audiovisual Program), a map from outside this dimension in which I currently found my self exploring, researching, and running from the local rulers, albeit overlords of abyss. The pogroms were a PRISM prison. This had been in the news as of late. SEATTLE (AP) – The Washington state Transportation Department says the contractor building a highway tunnel under downtown Seattle has finished digging a 120-foot-deep pit that can be used to access and repair the broken tunneling machine. State officials say Seattle Tunnel Partners’ crews removed the final scoop of soil Friday. They’ve moved about 20,000 cubic yards of material since mid-October. Next they’ll build a concrete cradle at the bottom of the pit to support the tunneling machine called Bertha. The contractor hopes Bertha will be able to chew through the pit’s 20-foot-thick concrete southern wall to reach the access pit. If that doesn’t work, the contractor will create the opening. Once Bertha is in the access pit, workers will use a massive red crane to hoist the tunneling machine’s front end to the surface for repairs. The plan is to move Highway 99 under the city, replacing the aging Alaskan Way viaduct. The tunneling machine broke down in December 2013 after drilling about 1,000 feet of the 2-mile tunnel. Bertha, at 17.5 meters (57 ft) in diameter, is the largest tunnel boring machine in the world as of 2013, built specifically for the Washington State Department of Transportation’s (WSDOT) Alaskan Way Viaduct replacement tunnel project in Seattle. It was made by Hitachi Zosen Sakai Works in Osaka, Japan, and the machine’s assembly was completed in Seattle in June 2013. The name Bertha, after Seattle’s only female mayor, Bertha Knight Landes, was chosen by a panel including the Governor and Transportation Secretary from submissions from kindergarten through 12th graders, who were asked to suggest names of a female who had significant Washington state heritage. After months of anticipation, the SR 99 tunnel boring machine nears completion. With the cutterhead installed, crews prepare for final rounds of testing before the machine is disassembled and shipped to Seattle. 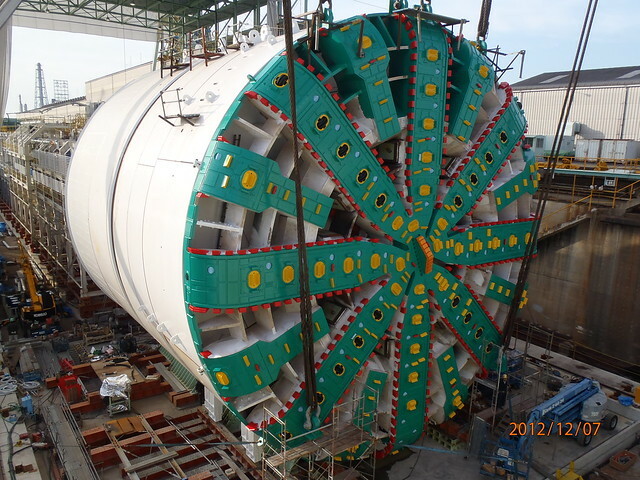 In late December 2012, representatives from WSDOT and Seattle Tunnel Partners will be on hand in Japan to officially accept the machine from its manufacturers, Hitachi Zosen. Learn more about Bertha, the SR 99 tunneling machine, at her webpage or follow her on Twitter @BerthaDigsSR99. Photo: This is a $13 million tunnel boring machine (TBM) used for tunneling at the Nevada Test Site. (Remember that Area 51 is part of the test site.) Many other types of TBMs are used by many govt. agencies, including the “nuclear powered TBM” that melts solid rock and leaves behind glass-like walls. Most tunneling activity is under military installations and all information is highly restricted. Former employees of said facilities have surfaced over the years to talk of massive underground installations in places like Area 51, Northrop Facility in Antelope Valley, Ca. (rumored to have 42 levels), and the Lockheed installation near Edwards, Ca. These boring machines are like huge, steel-encased worms. Sealed in each machine are teams of 35 men who line the cavity of the tunnel with concrete and guide the muck down the track. The machines bore the hole, remove the earth, and pave the inside of the tunnel with precast concrete segments. The digging face of the machine is a 95-ton, 28-foot-6-inch diameter disc, divided into cutting blades. The borer is 300-feet long. The September, 1983 Omni ran a picture story on the “Subterrene,” a nuclear tunnel-boring machine developed at Los Alamos. The machine burrows through deep underground rock, heating it to a molten state (magma), which cools after the Subterrene moves on. The result is a tube with a smooth, glazed lining that can be used for the high-speed transport shuttles that link the sub-base complexes. Humanity had a long, long history in the subterranean. And BGPD’s weren’t the entrances / signifiers to the tunnels. Rev 9:11 And they had a king over them, [which is] the angel of the bottomless pit, whose name in the Hebrew tongue [is] Abaddon, but in the Greek tongue hath [his] name Apollyon. The Abyss: One word translated “hell” is the “Abyss” or the bottomless pit. The term “abussos” is mentioned nine times in the New Testament. “This entrance, obstructed in our day by sands and rubbish, may still be traced between the forelegs of the crouched colossus. It was formerly closed by a bronze gate whose secret spring could be operated only by the Magi. It was guarded by public respect, and a sort of religious fear maintained its inviolability better than armed protection would have done. In order to understand why sacred monument are placed where they are found, see the following video by David Flynn. Notice the similarity between the Giza Passageways cross-section view of the pyramid at the top of this blog and the logo of Fastrak (www.thetollroads.com). The toll road goes from Orange County John Wayne airport and dumps out north of Camp Pendleton Marine Base. Exiting at La Paz road drives right by the Chet Holifield pyramidal ziggurat. A low pressure release sound, sppusssshhhh, the BGPD panel opened slowly. Where I was headed didn’t fit the into the paradigm of the above ancient known knowledge. It was out of place and out of time, the most amazing OOPPart. And it’s why would I could, for the moment, escape my immediate chasers, the klronors. It was the cloaking robe that provided the cover I needed to make the hurried jaunt from the apartment complex to the BGPD we had just entered and descended. WIthout the cloaking robe I would have been unable to escape the klronors. Klronos were CONNECTED (Centient Optimized Neural-Net Ecomm Connected Transcenders Energized Devices) to the UBIQUITY (Universal BORG EYE Quantum Intelligence Thing Youverse) grid, the grid was forthtold under the guise of SkyNet in the Terminator movies. And without my MAP, I’d be dead in the water, or at least greatly restricted by the options, due to the lack of access codes. As I mentioned, where we were headed was fascinating to say the least. The BGPD’s not only represented access to the underworld, they represented access to the TUBE (Transversing Universal Bifurcating Extruder). An subterranean glass tube network of unknown origin. Just glass. And it was analogous to the pneumatic tube systems used in banks and corporate buildings for mail delivery. It was transparent, autonomous, cerebral, and had no markings as to the origin, and interfaced with occupants telepathically. Pressurized capsules were entered via spiral opening airlocks. Telepathic communication with the autonomous vehicle allowed for travel details and seating that materialized from the walls to form fit each occupant. Of course, as always, there were forthtells above. As above, so below. “Like the flagship Fifth Avenue Apple Store in New York, the Shanghai cylinder is made almost entirely of huge monolithic glass slabs, with only connecting joints fashioned out of metal,” writes AppleInsider which first reported that the USPTO granted the patent to Apple. The PRISM Prison and Lords of the Nether Realm love to show their true colors. Former NSA spy turned whistleblower Edward Snowden may soon ‘disappear’ following his mega leak regarding the NSA tracking operation known as PRISM, and new information reveals it may already be in the works. And the abyss, as the name implies only emitted dark light. The “All Seeing Eye” is watching you. Google has intimate and long standing connections to government spy networks. As an IDEJ one is trained in the art of Full Spectrum Analysis. FSA derives from the field operations combat training in Full Spectrum Dominance. Wikipedia: Full-spectrum dominance is a military entity’s achievement of control over all dimensions of the battlespace, effectively possessing an overwhelming diversity of resources in such areas as terrestrial, aerial, maritime, subterranean, extraterrestrial, psychological, and bio- or cyber-technological warfare. Full spectrum dominance includes the physical battlespace; air, surface and sub-surface as well as the electromagnetic spectrum and information space. Control implies that freedom of opposition force assets to exploit the battlespace is wholly constrained. In order attain dominance one must know the enemy. Knowing the enemy is achieved by analysis of the length, width, breadth, depth of the spectrum occupied by the adversary. It is said that beauty is in the eye of the beholder and that a picture is worth a thousand words. And so, a riddle may convey more in the mind that what I relate in another way. The answer to the riddle is pattern seen through eyes. You see, one must not take lightly the lengths to which our adversary will go to attain the pinnacle of perception. And perception is the name of the game. Either you see or you don’t see. And site unseen is the perception of the day we live in. For most are blinded by the third eye that colors how they see. That third eye sees all, knows all, and in turn, predicts all. And this is the key to the pattern of it all, the pattern to history, the pattern to the times we live in now. Lucifer seeks to be like God in all of His omni-characteristics. God is omnispective and so, our adversary seeks the same, to be like the Most High. As you can see, the keys to deciphering the logos (which all have a interconnecting pattern) are deriving from Scripture, the Holy Writ, a compilation of the mind of God, a knowing of who He is, will be, and can be depended upon to act accordingly. The being the logical case, the number one rule for undertaking the path of an IDEJ, is to read Scripture in entirety, over and over. Reading produces the images, the patterns of interconnectedness that are mirrored in culture by the god of this world. This of course is the most heavily guarded secret of the enemy. The reason why the Bible is banned, prayer (communication with the Creator), and the subsequent knowing of the pattern of interconnectedness of all things created. Patterns are evidence of design and design implies a designer and a purpose for the creation. of or relating to a person’s body, esp. as opposed to their spirit. of or relating to a corporation, esp. a large company or group. (of a company or group of people) authorized to act as a single entity and recognized as such in law. of or shared by all the members of a group. a corporate company or group.